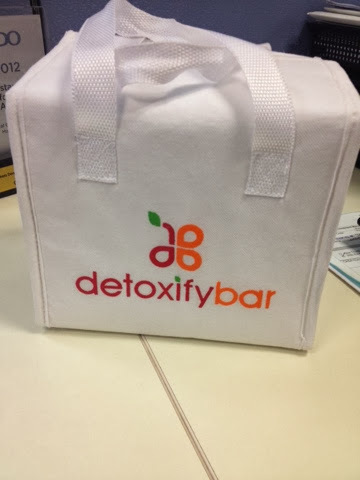 One Day Cleansing c/o Detoxify Bar | Vanity and Everything in Between. People are always finding ways to be fit nowadays. Run marathons are held almost every month. Thre are a lot of healthy restos popping out left and right. Then now, juicing is a fad! I really want to go back to the gym. But I know myself too well. Truth be told, I'm lazy to exercise. And yes, this is coming from an athlete back in college. Yes, I'd do stretches and all that to warm up. But exercising for like an hour straight? Nah-uh. But as the BIG day approaches, I gotta force myself to live a healthier lifestyle. So, I finally gave in and tried juicing. I went to Detoxify Bar in Eastwood to buy a kit for the upcoming days. Click read more too see the drinks I chose to drink! Since Lawrence and I love to eat out - I admit that we don't always eat the healthiest food out there. We love junk food. 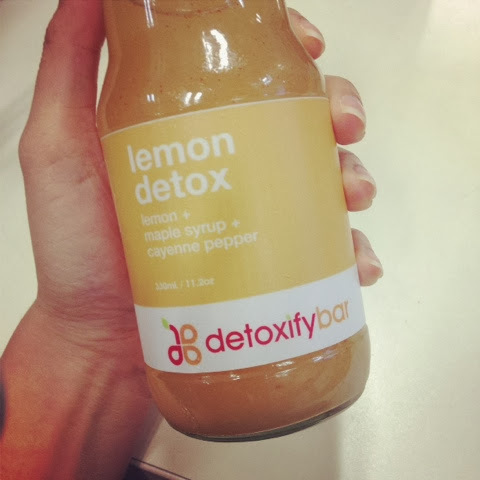 The point of Detox is to cleanse your body from all the unhealthy food intake. Think of it as a vacation for your body. A much needed R&R healthy style. 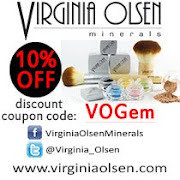 The One Day Cleansing Kit includes 5 Detox Drinks of your choice and two tea bags. You're not supposed to eat anything - just these 5 drinks - for one day! It really is a challenge especially if you could smell food one foot away from you! So, at 8am I started drinking my first bottle. At 10am, I started drinking my second bottle which is the Lemon Detox. This is apparently a frustrating drink. I hated every drop of it. 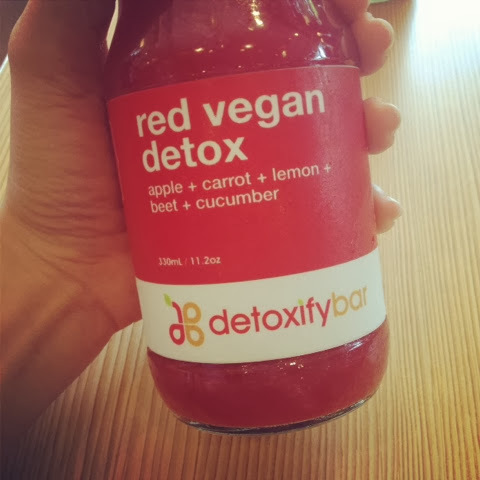 For lunch, I had the Red Vegan Detox. I could definitely taste the veggies in this drink. But it's tolerable. 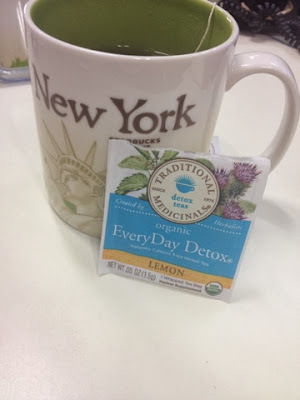 After drinking the Red Vegan Detox, I had lemon tea. Around 3 or 4pm, I had my fourth bottle which is the Mint Berry Detox again. I didn't take a photo of it anymore as I was able to take a photo of the first bottle. For dinner around 8pm, I had the Green Vegan Detox. I had a hard time finishing this bottle cos I can smell the celery. And I don't like celery. After an hour and a half, I had my laxative tea to end my day. This one day cleansing was harder than I thought. At first, I felt really full. Then in the afternoon, I started to feel hungry. By late afternoon, around 5pm I was already feeling lightheaded. When I got home, I slept for a bit to ease my being lightheaded. Nothing happened though when I woke up as I still felt lightheaded. But I still went ahead and finished the bottles. What I noticed though is that my urine were crystal clear for 3 straight days. That for me, was a sign that my body is clean. Juicing made me appreciate vegetables more. As a matter of fact, despite being lightheaded, I'm still excited for my next one day cleanse. If I get used to this, I'll go for the 3 day cleanse! 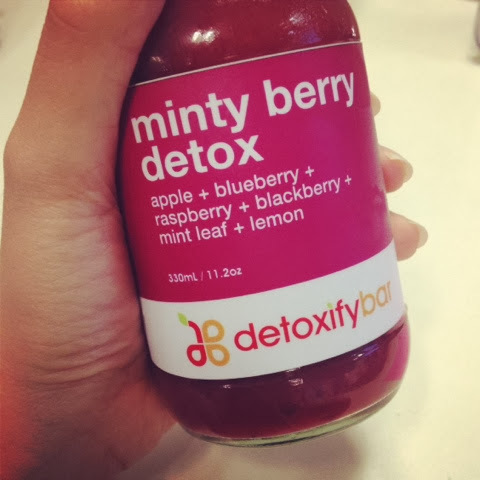 Have you tried one day cleanse? Any thoughts on it? 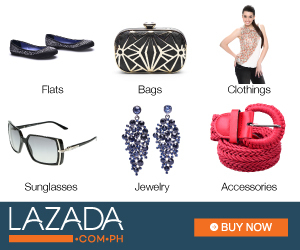 Any of you had rashes after the detox?